The bullet holes, smashed masonry and blood on the walls of the burned-out consular building on the southern outskirts of Benghazi are testament to the gun-battle that raged through the building, claiming four lives including that of the US ambassador, Chris Stevens. The owners of the damaged consulate building and the accommodation block a mile down the road took the Guardian on a tour of the sites on Thursday. Reports that the attack was the work of an isolated group seemed to be at odds with the physical evidence of the attack on Tuesday and what their staff had told them. It is clear the Americans and their Libyan guards were subjected to a terrifying, night-long ordeal, which began with protests outside the consulate in the al-Fawahat residential district. Demonstrators gathered in the narrow Venice Street outside the main gated entrance, voicing protests against the reported release in the US of a film that ridiculed Islam. The protest quickly turned violent, the landlords said. Who fired first is a matter of dispute, with some claiming the Libyan security guards hired by the Americans shot in the air, panicking the crowd. There is no doubt about what happened next. The compound is bound by a breeze-block wall topped by barbed wire, but it was not enough to stop the attackers. “They jumped in from everywhere,” Busheri said. In the melee, a single rocket-propelled grenade appears to have been fired from within the compound, detonating on one of the heavy concrete barriers set up outside to deter car bombs. Several of the consulate’s Libyan guards were injured during the fighting and others melted away, the landlords said, leaving the diplomats to fend for themselves. Embassy staff had prepared for such an eventuality, having built themselves two positions with sandbags on either side of a villa to the left of the main gate. Three of the Americans, including Stevens, were forced to retreat from these positions towards the small terrace in the centre of the villa. This, according to Busheri, is where two of Stevens’ security guards died. Stevens himself ran inside the villa, the landlords said, where he suffocated in the smoke from the blaze that has left the interior of guest rooms and a kitchen charred, blackened and heavy with the stench of putrifying food. Once the mob had seized the compound they looted it. The surrounding lawns are covered in stray US Army readymeals, broken furniture and, incongruously, the dustjacket of Simon Sebag Montefiore’s book on the history of Jerusalem. There is evidence that at least some of the demonstrators were horrified by what they saw: a group of civilians found the ambassador, smoke-blackened and bleeding from a cut in his head, and rushed him to the city’s main hospital, Benghazi Medical Centre. Staff there had been expecting the ambassador at 11am on Wednesday as he had come to Benghazi to inaugurate a landmark medical exchange project between the centre and Harvard Medical School, the centre’s director, Dr Fathi al-Jehani, said. Instead, Stevens’ body arrived at the emergency ramp at 2am, together with a Libyan embassy translator who had been shot in the leg. Emergency staff had heard the sound of fighting hours before and sent an ambulance, but it became lost in the confusion. “We tried to revive him,” Jehani said. He did not finish the sentence. The night’s fighting had not finished. A mile south of the consulate is a smaller walled compound used as accommodation for the majority of the dozen US staff posted to Benghazi. As the crowd surged into the consulate, one group of diplomats managed to bundle themselves into a white armoured jeep, forcing it out through the main gates, the landlords said. It tore down the highway towards the accommodation block, surviving an attack as it drove through the armed mob. Ahmed Busheri, the owner of the consular building, said the jeep arrived at the accommodation compound gates at 4am and an hour later, the protesters that had torched the consulate arrived outside. “At about 5am [the mob] came here to try and ambush, there was an exchange of fire,” Busheri said. Inside, he showed the result of the fighting. A projectile, possibly a rocket-propelled grenade, had clipped the outside wall and smashed into the main building, blowing out a chunk of masonry. Immediately below it, flecks of brownish blood were spattered on the garden wall, where the fourth American was killed. Staff were able to hold off the mob for an hour until government security forces arrived on the scene as dawn broke. Both compounds now lie empty. The consulate’s buildings have been torched and three embassy cars are blackened wrecks. US officials arrived at the accommodation block on Wednesday to remove the belongings of the staff living there. Signs of the diplomats remain. The grey dumb-bells of a makeshift gym remain outside the main gate. Nearby, a whiteboard pinned to the wall has the instruction: “pick up your trash before leaving”. It is a refrain heard across this shocked city. 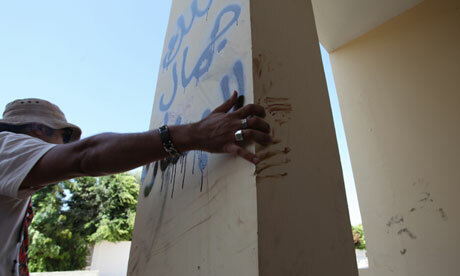 Stevens was one of the first US diplomats to arrive in Benghazi at the beginning of last year’s revolution. He had a reputation here and in the capital, Tripoli, for his enthusiastic backing of medical and social initiatives, and for his informal style. “He had good relations with my colleagues,” said Jehani. “So he was loved?” a journalist asked. “He is loved,” said Jehani, emphasising the word “is”. Benghazi has suffered from activities blamed on jihadists for several months, and anger is directed equally at the protagonists, and at a government seen as unwilling to stand up to them. Last April a United Nations convoy carrying the envoy Ian Martin was bombed in the city, followed by attacks on the Tunisian consulate and the office of the International Committee of the Red Cross. Jihadists also wrecked a Commonwealth War Graves cemetery in the city and, though it has been repaired, the vandalised stone cross that formed the cenotaph has not been replaced. In June, the British ambassador Dominic Asquith narrowly survived when a rocket missed him and hit the armoured car carrying his security detail, two of whom were wounded. The Islamist Ansar al-Sharia brigade is blamed by many here for the violence, particularly with the appearance of a video that appears to show two US embassy vehicles plundered from the burning compound being driven into the brigade’s Benghazi barracks. Brigade leaders have issued a denial of responsibility but were unwilling to talk to journalists on Thursday. There is also unease about how America will react. It has not had an ambassador killed since 1979, and Barak Obama’s vow that “justice will be served” has fuelled rumours that US marines now deployed in Tripoli will head to Benghazi to enforce that justice.